Not sure if this fits here or in the buy and sell. Looking for who sells the sportquattro type hood that fits the coupe gt/urq in the usa. A couple years back I had found a site that made them but can't seem to find it anymore :/. I think they had an extra uv protection option. Mine has taken a beating under the sun. Starting to have cracks in a few places. Mostly at the vents. Not sure it's fixable without having them come back in a year or two? I've looked around for others but they all seem to have the wrong vent count. Cool wheels aka Carbon Destroyer Jr? PRY4SNO wrote: Cool wheels aka Carbon Destroyer Jr? lol nah, this is the nicer sgi type. The one with droopy rear sides and oem hood pin provisions at wrong place but right looking side vent and 6 rears, just had too much sun over the years. Shoulda painted, ...well high speed might have contributed. I’m not being funny here but the only place that I know of stateside is 2bennett . They are pricey but not sure if any of the alternatives overseas would be much better after VAT and shipping . 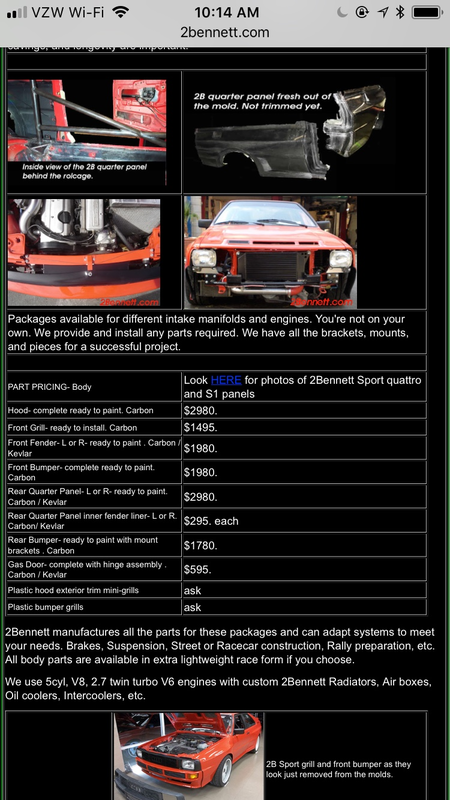 Yea seen 2bennet, from a quick look seems to only have the sportquattro hood, wouldn't fit the ur. Maybe i saw it on gmgracing, or visracing and was dropped. At this point i think whatever i saw it on went out of business or just fell off the internet search results. I guess i can always sand and add some more flexible surboard resin and re-clear but hard to get close to the weave without messing it up. Pretty messy job.